the Three Sisters are visible in the distance at left. 7985 ft (2434 m) . Newberry Volcano is the largest volcano in Oregon, a broad shield volcano with a huge area of 600 square miles (1500 square km) and massive volume of 110 cubic miles (450 cubic km) which are second only to Medicine Lake Volcano in the entire Cascade Range. These two volcanoes are near twins, with similar size, elevation, structure, evolution, and volcanic products. Both are located in the high desert, well east of the Cascade Crest, and thus receive somewhat lower snowfall than the main range to the west. The summit of Newberry has collapsed to form a large 3 x 4.5 mile (5 x 7 km) caldera known as Newberry Crater, which holds two lakes, Paulina and East Lakes, that contain a number of hot springs revealing that magma lies close below the surface. Several large and easily accessible obsidian flows cover large portions of the caldera floor, while the flanks of the shield are studded with over 200 cinder cones. The numerous lava flows originating from these cinder cones contain dozens of known lava-tube caves, including several whose depths hold permanent ice throughout the year. 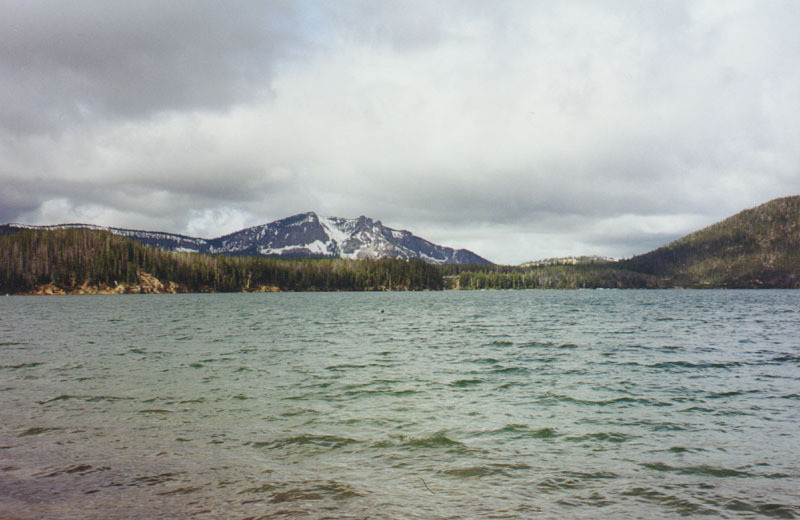 Despite these similarities to Medicine Lake, there are a number of important differences which make Newberry a better ski objective. The highest point on Newberry is Paulina Peak, a massive extruded dome which has a gravel road to its summit. The northern side of Paulina Peak is steep, with a number of gullies offering excellent (albeit somewhat short) downhill runs. Newberry is also much more developed, since it was declared a National Volcanic Monument in 1990. The main access road is excellent and paved, and it is plowed in winter to access two snowparks, the closest of which is only 2 miles from the caldera rim. In spring, the remaining segment of the road into the two lakes is also plowed open, allowing very short access to a variety of nice ski routes, most of which are more cross-country than downhill. Unfortunately, despite its semi-protected status as a National Monument, all of Newberry is open to snowmobilers, and they usually outnumber the skiers in both winter and spring. (13 km) This easy but circuitous route ascends the snow-covered road to the summit of Paulina Peak, following a gentle 10% grade as it winds and switchbacks uphill. In winter, a nordic ski trail parallels the unplowed road from the last snowpark into the caldera, adding several miles to the trip. The main reason for doing this route is the astonishing view from the summit. The entire length of the Oregon Cascades fills the western horizon, from Mount Hood all the way south to Mount Shasta in California. To the south lie hundreds of cinder cones dotting the southern flanks of Newberry itself, while to the north and east is the broad expanse of Newberry Crater with its two lakes, several obsidian flows, and Central Pumice Cone. (10 km) Descending the summit road may satisfy cross-country skiers, but most ski mountaineers will look for something more interesting. The two best options are to ski down the northeast or northwest sides of Paulina Peak. 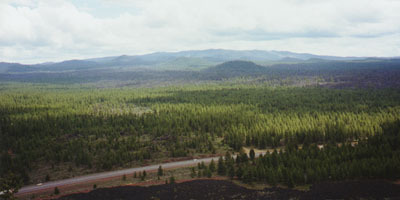 The northeast is a broad, steep bowl which drops directly from the summit down towards the toe of the Big Obsidian Flow, while the northwest side is series of steep, narrow chutes which drop through lava ridges and pinnacles in a bowl beginning several hundred yards northwest of the summit. 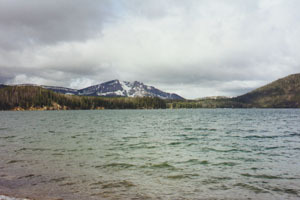 (11 km) North Paulina Peak is much less prominent and far less visited than Paulina Peak, a mere bump which is the highest point on the northern rim of the caldera. A trail leads along the rim from the Paulina Lake entrance, although this is a snowmobile route in winter. Instead of returning along the trail, a more interesting descent route heads due south down the sloping caldera wall to reach the Interlake Obsidian Flow, which completely spans the saddle between the two lakes. After crossing the flow, it is a simple ascent to reach the summit of the Central Pumice Cone, a large cinder cone towering over 700 ft above the center of the caldera. A short but steep descent followed by a long traverse around Paulina Lake leads back to the trailhead. 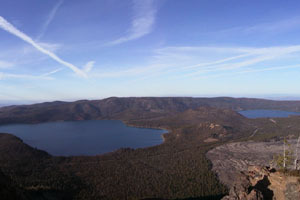 Paulina Lake (left) and East Lake, and the Big Obsidian Flow (lower right). The summit of Paulina Peak is at upper right.